If you are worried about head separation while you are shooting it will affect your scores. To ease your mind select a piece of brass and hacksaw it down the middle lengthwise,clean it up with a file or belt sander and deburr. Now you can see the thickness of the brass. 46 gr. of varget is a bit stiff with a 168 smk and is not needed at 600. Shoulder bump your brass only .002. If you are full length sizing each time keep a good eye on overall length. My loads,depending on case volume run from 43 to 44.5 of varget with the 168 smk and do well out to 800 yds. Few shooters fully understand that chamber clearance (at the shoulder) needs to be kept to a minimum, like -.002" or less. This tool is very simple to operate, and it accurately measures chamber clearance at the shoulder. 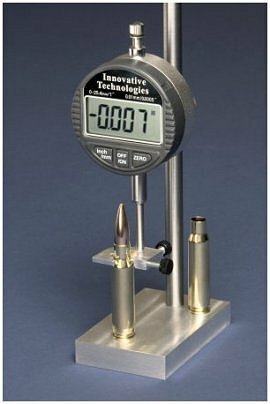 I developed this Digital Headspace Gauge to show how YOUR handloads fit in YOUR particular chamber. Many shooters rely on bumping their shellholder into their resizing die to get their correct headspace. This is definitely not the best way to do it - not even close. Unlike the RCBS Precision Mic, our Digital Headspace Gauge works on ALL calibers. Unlike the Stoney Point tool (now Hornady) our gauge doesn't require using a collection of bushings to operate, and you also don't need to balance your cases on the blade of calipers to measure a case. John, let me know if you still need a 40S&W case. Does it need to be resized or just fired? Thanks impalacustom. I might be able to make it to the range this weekend to see if I can find a couple of 40s&w cases. I'll let you know if I don't find any. Thanks again. RJ, I'm going to disagree with one aspect of your post. With a few exceptions, very little in reloading is cast in stone. There is most certainly a rifle/caliber combination that virtually never lends itself to anything other than FLS. The 7.5 Swiss in the k31 and the zfk55 (among a few others). Less than FLS usually ends up with sporadic chambering results in those rifles and case neck only sizing will be nothing short of frustration.